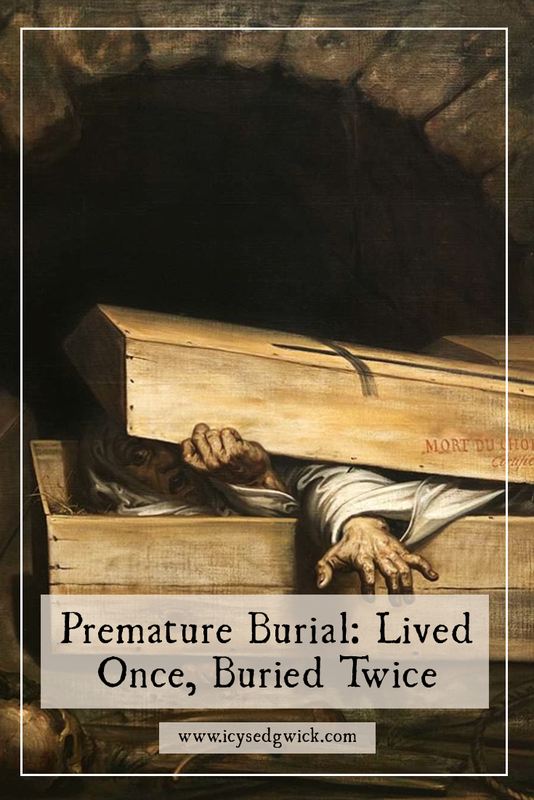 Premature Burial: Lived Once, Buried Twice! Urban myth or real problem? Fear of premature burial reaches that primal part in all of us that Sigmund Freud surveyed in his 1919 essay, ‘The Uncanny’. Edgar Allan Poe explored the horrors of premature burial in his 1844 story, ‘The Premature Burial‘. Stephen King even skirted the edges of the fear with his short story, ‘Autopsy Room Four’. In it, a man wakes up to find himself conscious but paralysed on the autopsy table. The fear is referred to as taphephobia, of ‘fear of graves’. Christine Quigley discusses the burial reformer William Tebb in her book, The Corpse: A History. In 1905, he claimed he’d collected accounts of 219 cases of near live burial, 149 cases of actual live burial, 10 cases of live dissection, and 2 cases of awakening during embalming. But was premature burial really that common? even used the ‘sniff test’ to smell for decomposition. The invention of the stethoscope in 1816 gave doctors a slightly more accurate way to monitor the heartbeat. Richard Joltes also notes the dual purpose of “laying out” the corpse. It gave the family time to make preparations, but it also allowed them to watch for signs of life. Even in the early 20th century, news stories describe people regaining consciousness during the funeral, or at the wake. In earlier centuries, burial plots or crypts could be re-used after a passage of time and charnel houses stored the disinterred remains. According to the legends, some of these corpses had broken fingers, torn lips and horrified expressions. People jumped to conclusions and assumed the poor victims were buried alive. 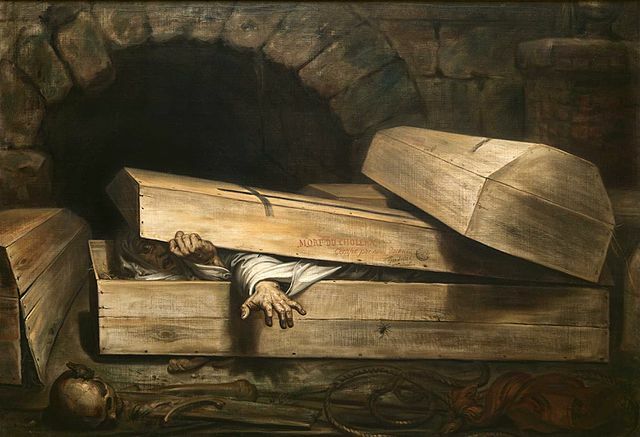 I’ve found plenty of stories of ‘corpses’ being revived when their coffins are dropped. Some regain consciousness during the process of embalming or even dissection! Franz Hartmann even suggests in his 1896 pamphlet Buried Alive: An examination into the occult causes of apparent death, trance and catalepsy that the phenomenon partially explained vampires. He cites cases in which exhumed bodies bore bloody lips, most likely from bitemarks. Paul Barber, in his 1990 book Vampires, Burial, and Death: Folklore and Reality, refutes this, saying “there is simply no evidence that starving people chew on themselves to assuage their hunger” (p99). Jörgen Hartogs tells a story about a wealthy lady who died sometime around 1849 in New York. Her husband decreed she would be buried in her finery. More importantly, there would be no autopsy. The undertaker decided to remove her jewellery prior to burial, and while taking off her diamond ring, managed to tear the skin. The pain was enough to rouse the woman, and the undertaker naturally fled. She regained consciousness and returned home. According to the post, she went on to have children, so the experience didn’t leave her too worse for wear. I’ve actually heard this story before, albeit attributed to both a house in the City of London and a house in York. Versions of the story exist throughout Europe during the 14th to the 19th centuries – and clearly in the United States too. The main plot is the same, although some details vary. In some versions, the grave robber dies of fright, in other versions the woman has to walk incredibly far to return home. Sometimes her husband or servants think she is a ghost and bar the woman from her own home. One of these ‘Lady and the Ring’ stories relates to a Margorie McCall in Lurgan, Ireland. In 1705, she died of a fever and a swift burial followed to prevent the infection spreading. A grave robber broke into her grave to steal her expensive ring. His efforts revived Margorie, and she went home after the robber fled. According to the legend, her husband John dropped dead of shock when he answered the door. Margorie McCall really did live in Lurgan, but no evidence exists to prove the story. Despite that, a local stone mason created his own memorial in the 1860s. The stone reads, “Margorie McCall – Lived Once, Buried Twice”. He added it to the headstone of a John McCall in the town cemetery, though there’s no way of knowing if it’s the same John McCall that died of fright! Jacqueline Simpson tells a premature burial tale in her 2013 book, Folklore of Sussex. A tombstone in the Rye churchyard features a woman sat upright in a coffin. According to the legend, the lady in question was narcoleptic. One of her episodes lasted so long that doctors pronounced her dead. Her family laid the coffin in a room at the old Flushing Inn. Luckily the rising warmth from the kitchen below roused her. Naturally everyone got rather a shock when she appeared downstairs, complaining about being cold. Simpson notes the carving more likely relates to the resurrection of the dead on Judgment Day, but “this was misinterpreted by later generations as a warning about the risk of premature burial”. The British medical community ridiculed Franz Hartmann’s 1896 pamphlet Buried Alive. They considered Hartmann’s comments to be ludicrous at best and it’s hardly surprising. Hartmann even asserted that even putrefaction didn’t guarantee that a person was dead. Despite that, the London Association for the Prevention of Premature Burial (LAPPB) formed in 1896. 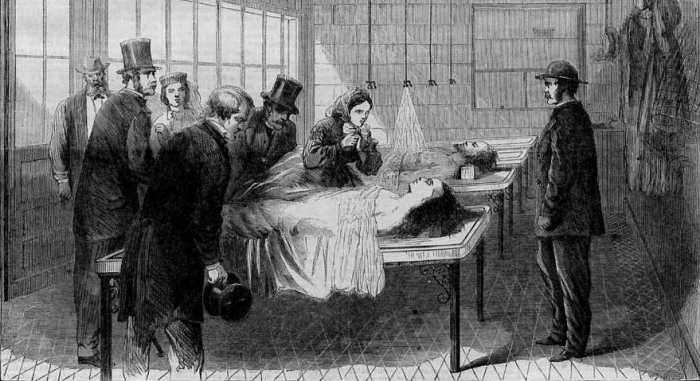 Germany introduced waiting mortuaries to monitor corpses for signs of life. Strings tied to corpses would ring bells if the corpse moved. One of the more famous inventions following the fears was the cemetery bell. Some believed the sayings “Saved by the bell” and “Dead ringer” relate to these bells. In 2009, David Wilton debunked the theories, which is a shame because they make a nice story! Another type of safety coffin allowed anyone buried prematurely to pull a cord, waving a flag above their grave. I really hope no one did this in a windy cemetery. Hand wheels fitted inside surface crypts allowed anyone buried alive to open the door and climb back out. Some people left instructions in their wills that steps should be taken before burial to avoid premature burial, such as severing the arteries in their neck. Elsewhere physicians might press red hot pokers against the feet, push needles under the nails or burn the skin – anything to determine if the corpse was, in fact, a corpse! I actually wrote a story, inspired by such grave bells, which you can find here. Thankfully, premature burial is unlikely nowadays since better technology makes it easier to pronounce death, even if definitions of death have shifted. That said, according to ABC, a live occupant was discovered in a body bag in Massachusetts in 2005. In 2014, a woman was buried alive in Thessaloniki, Greece after being declared dead at a private hospital. Children playing near the cemetery heard her screams and alerted police. You can find the news story here. A second woman in Thessaloniki, Greece suffered a similar fate in 2015. This time, her cancer medicine caused her to be declared dead. She actually died of heart failure inside her coffin. 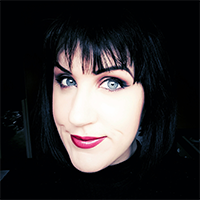 Have you heard any stories about premature burial? Pay a visit to the Dead-house! What do you think? Do you think any of these occurrences actually happened? The most recent ones did, but I don’t know how much the fear in earlier centuries was just a panic, and how much was an urban legend! The newspaper stories always talk to a friend who knew someone, rather than anyone directly related to someone who’d suffered. Great stuff! As Sacha said, ‘crazy fascinating’. I really understand that phobia ~ imagine being in a coma before people know what comas were…. and then there are the various films that have people buried alive – wasn’t Jack Bauer once in a coffin, in 24, or have I just imagined that??? That sounds like the kind of thing they’d do in 24! Then there was the Kill Bill segment where the Bride had to dig her way out! Horrible way to go though. Glad you enjoyed my article on the topic. I used a lot of material from British Medical Journals of the latter 19th century for the background. The effect basic knowledge of electricity, and the discovery of ether and chloroform as having the ability to render people insensate, were major contributing factors to the changing attitude toward death in this era — largely obsolete words like ‘syncope,’ ‘trance,’ and ‘suspended animation’ were coined during this era to describe various theoretical states!